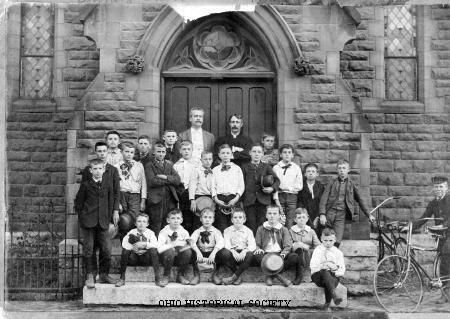 Photograph of the Trinity Episcopal Church boys' choir, Columbus, Ohio, ca. 1890-1899. The Episcopal Church was founded in 1789 in Philadelphia, Pennsylvania. During the years of British colonial settlement in America, the head of the Church of England was the King or Queen of Britain. With the success of the American Revolution, many Anglicans in America no longer wished to follow the direction of the King as the head of the Anglican Church. These American Anglicans formed the Episcopal Church. The customs and beliefs of the Episcopal Church came from the Anglican Church in England. The Episcopal Church was much more democratic than its predecessor was and gave its congregations a greater say in the practices of the Church. The first Episcopalians arrived in the Northwest Territory during the late 1700s. Although they remained few in number, Episcopalians played a vital role in Ohio's growth. One of the earliest and most important Episcopalians in the state was James Kilbourne. He was an Episcopal clergyman, who helped establish the communities of Worthington, Bucyrus, and Sandusky. Philander Chase, a bishop in the Episcopal Church, helped establish Kenyon College in Gambier in 1824. For most of American history, the number of Episcopalians in the country has remained relatively small. During the 1990s, roughly 2.5 million congregants belonged to the Episcopal Church in the United States.